This skirt was one of my semi-failed experiments in embellishment. I decided that my favorite gathering trick with a strong length of thread and a zig-zag stitch might work as decoration. With the loud print, the crochet thread really does not show up very well, but could work to great effect with a contrasting fabric and thread. With the small amount of fabric I had left after cutting the extremely large skirt pieces, I cut long lengths of the fabric, finished both sides, and pleated the strip. I really like this technique; the only issue is that the quilting cotton is not printed through to the wrong side of the fabric, so if the “ruffle” gets pushed to one side, it looks a bit odd. Too often, I make a skirt, only to find that I have nothing (or very little) to match back to it. This skirt is one of those projects. 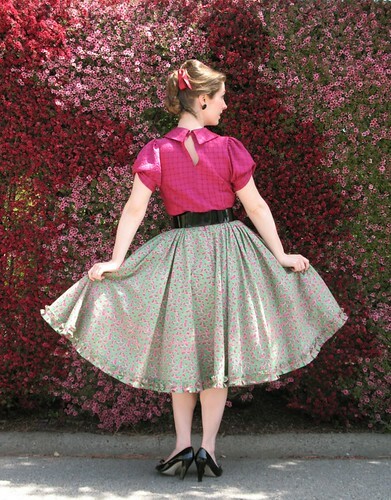 The fabric makes the perfect 1950s full skirt - but what do you pair back with the fabulous watermelon print? Black would work, but where is the fun in that? And I have no desire to look like the Jolly Green Giant. So, pink it is! But it has to be the perfect pink. Well, the poor dear has been languishing in my closet for a few years. No perfect pink to be found. 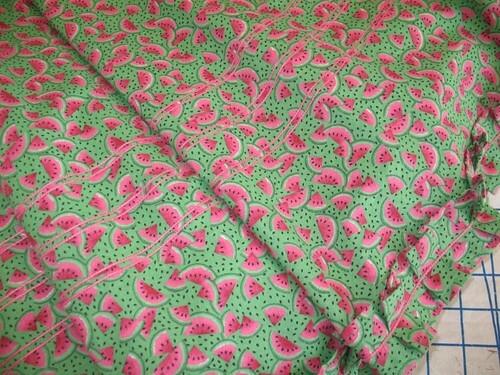 And than I remembered that I had the perfect fabric right in my sewing room. Right in time for "Tickled Pink" Week over at The Sew Weekly. In fact, I am today's featured project! It's all very exciting! Cutting the pieces on the bias did something that I was not expecting. The diamond pattern was created on grain, so when I cut the pieces on the bias they became squares. Ooohh, it’s magic! Diamond turning into squares! I cannot believe I missed that. Embarrassing, much? Before I had completed the blouse and put the collar and bow in place, I was disappointed that the diamonds were gone. But it turns out, I really do like this one! Yahoo for leftover fabric scraps! So here is my successful frankenpattern (LOVE those sleeves), and I believe I am that much closer to finding my ideal blouse pattern. And if you are interested in hearing more about the construction, click here! Adorable ensemble, both the shirt and the skirt. 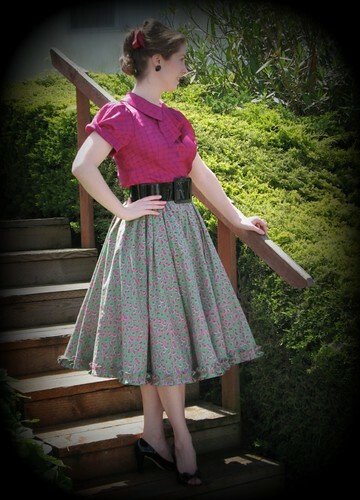 I have a few circle-skirts that are near-orphans, as well---obviously my wardrobe needs some tweaking. 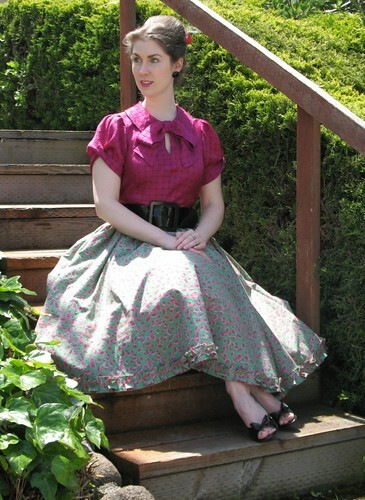 I think the ruffle really makes that skirt -- not that the print isn't wonderful, of course. Great job! This is so, so wonderfully sweet, feminine, and warm weather perfect. Love every fantastic element and detail. Absolutely gorgeous. I can't imagine how many miles of ruffles you must have needed to go all around that hem. Wish my failed projects looked this great! Absolutely BEAUTIFUL! 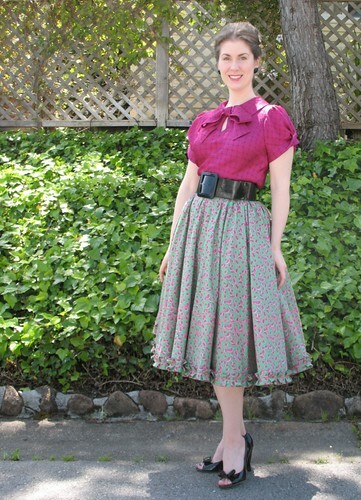 I just adore the blouse and skirt combo! Great outfit! I positively LOVE the sleeves on the blouse! I can see why you'd want to use them over and over. Oooh! Lovely prints - those blue birds are gorgeous! 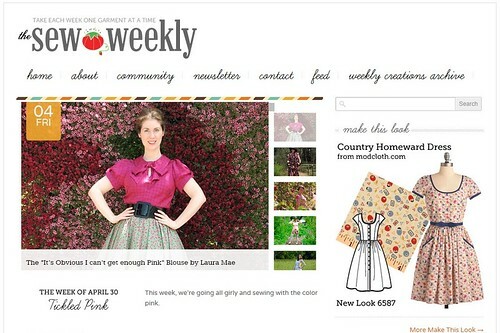 You're still front and center on Sew Weekly, AND on Elegant Musings right now. Ah Laura Mae - you've done it again... you've inspired me! 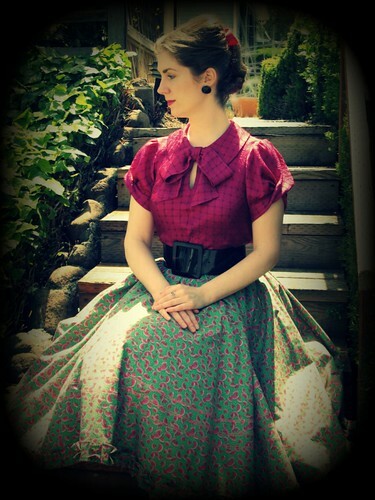 I LOVE the ruffle on the skirt. I'm just about to make a dress out of a solid colour fabric (lilac - my favourite at the moment) but I wanted to put some imbellishment on it because I thought it would be too plain. Then you blog about your ruffle... problem solved!!! THEN I see the blouse... I LOVE IT TOO! I'm going to buy both patterns, because the sleeves are to die for and I can see them being VERY useful. What a lovely compliment, Beccie! I, too, love the color lilac - I just cannot get enough purple! And I can't wait to see what you do with those sleeves.